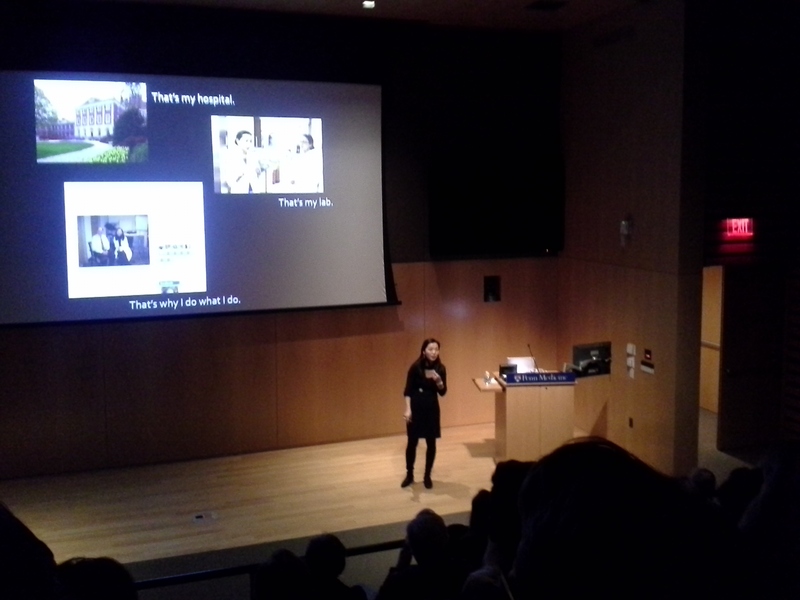 -Plus, a firsthand tale of postdoc-ing abroad, a recap of the Penn Neuroscience Public Lecture, and the Junior Investigator Symposium. Access the PDF here: _BPC_Vol_4_Issue_2_04.15.15. “Remain positive, remain relentless; the future is in your hands.” It was with these words that Dr. E. Albert Reece welcomed nearly four hundred attendees to the 13th Annual Meeting of the National Postdoctoral Association (NPA). The NPA, established in 2003, aims to advocate for postdocs, develop resources to support postdoctoral training, and to build community. The NPA works with federal agencies, such as the NIH and NSF, to enhance postdoctoral training, and has laid out Recommended Practices (1) that have been adopted by dozens of institutions nationwide. 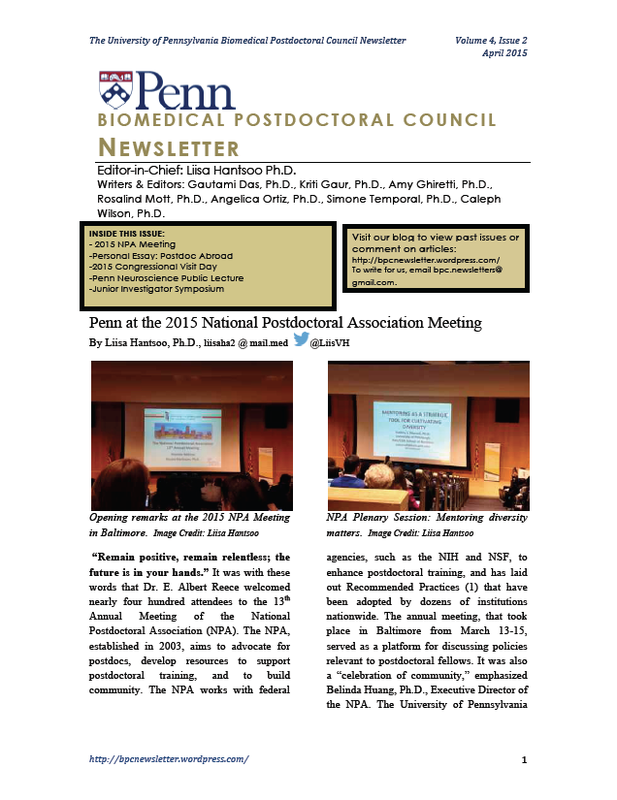 The annual meeting, that took place in Baltimore from March 13-15, served as a platform for discussing policies relevant to postdoctoral fellows. 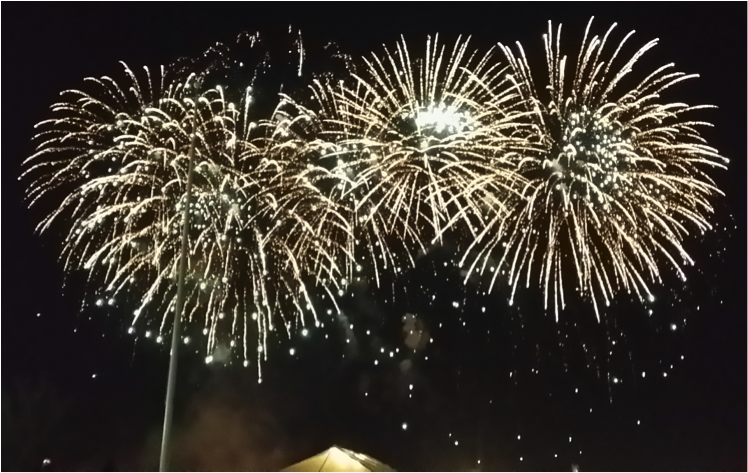 It was also a “celebration of community,” emphasized Belinda Huang, Ph.D., Executive Director of the NPA. The University of Pennsylvania was represented at the conference by five Penn and one CHOP biomedical postdocs, plus Mary Anne Timmins and Morgan Hiles from the Biomedical Postdoctoral Programs (BPP) office, David Taylor from Office of Postdoctoral Affairs at CHOP, technology licensing officer Carole Burns, Ph.D., and our BPP Associate Dean, Susan Weiss, Ph.D.. 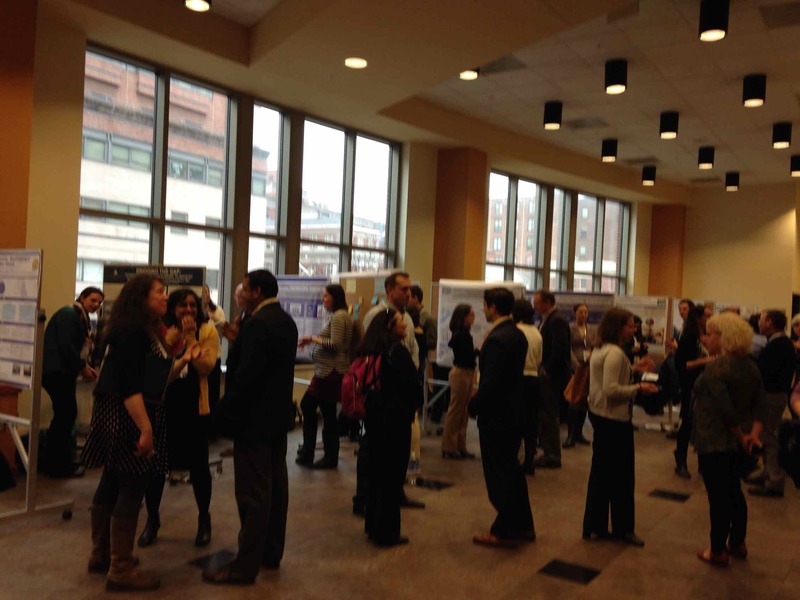 The Penn team attended a plethora of workshops and panels, and presented posters on postdoctoral initiatives at Penn. On the workshop level, there was significant focus on improving the postdoc experience for minorities and women in science. One workshop discussed efforts that have been made at a number of institutions to create a structured support system and mentoring for minority postdocs. 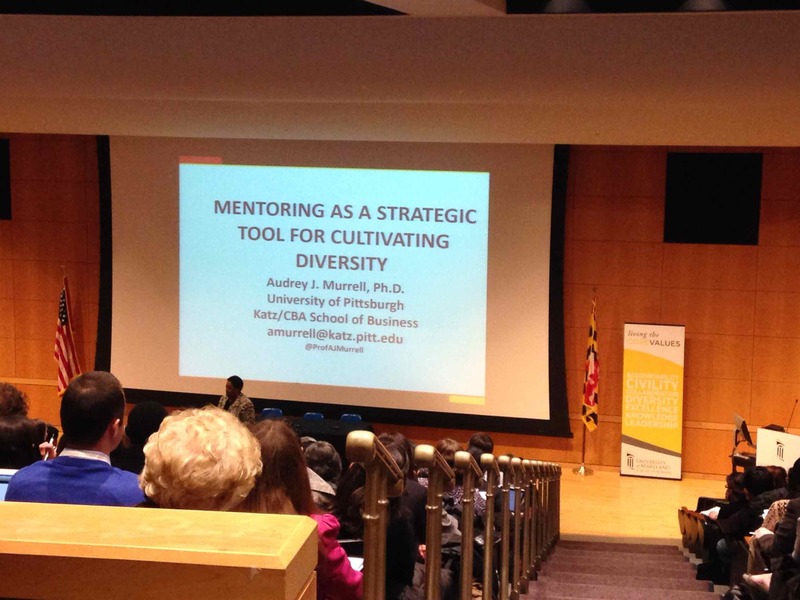 They encouraged “proactive, purposeful” mentoring. Another workshop addressed challenges facing women as postdocs, including family formation and the “leaky pipeline,” isolation, appropriate professional development, and finding adequate mentoring and support. Workshop members broke into small groups to discuss these issues and offer insight on how they might be improved. Other workshops offered practical career skills for postdocs. For instance, one workshop walked postdocs through the process of salary negotiations, giving them practical tips and simulated practice. Postdoc and Penn Center For Innovation (PCI) Fellow, Vladimir Popov, and PCI Licensing Officer, Carole Burns, presented an interactive workshop on careers in technology commercialization, with emphasis on tech transfer and intellectual property. “Innovation in Action” sessions focused on distilling the chatter into usable bits, using an interactive format and solution sharing. The “Future of Research” session encouraged postdocs to brainstorm solutions for problems in training, transparency, connectivity, funding mechanisms, and competitiveness. Breaking into four groups, postdocs thought, talked, and littered the conference room walls with colorful Post-It notes scribbled with their ideas on how postdocs might tackle these challenges. 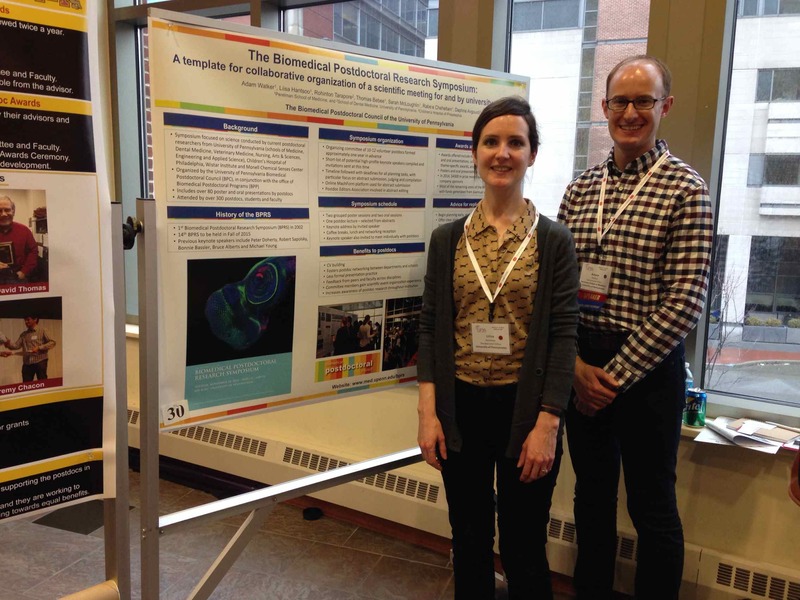 A poster session allowed postdoctoral programs from across the U.S. to highlight the work that they do to improve the postdoctoral experience on their own campuses. 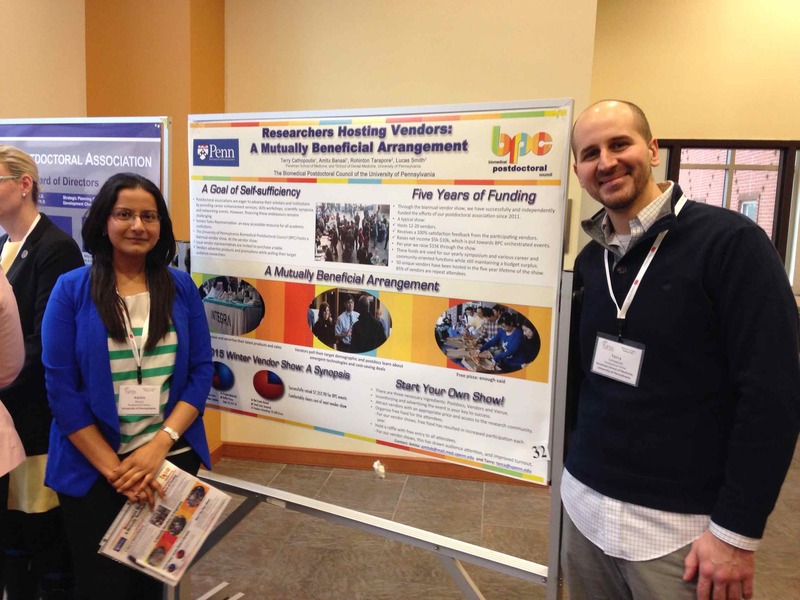 From Penn, Terry Cathopoulis, Ph.D. and Amita Bansal, Ph.D. presented “Researchers Hosting Vendors: A Mutually Beneficial Arrangement,” that described Penn BPC’s fundraising via vendor shows, and Adam Walker, Ph.D. and Liisa Hantsoo, Ph.D. presented “The Biomedical Postdoctoral Research Symposium – A Template for Collaborative Organization of a Scientific Meeting for and by University Postdocs,” focusing on Penn’s annual BPC symposium featuring postdoctoral research. From CHOP, Paulette McRae, Ph.D., presented “Fostering Careers Beyond the Bench: The Evolution of the CHOP Administration Fellowship.” The posters were well received, and sparked conversations with representatives of other postdoctoral associations across the country who were interested in modeling Penn’s experiences to build events at their own institutions. The annual meeting closed with a Town Hall, in which findings of the 2014 NPA Institutional Policy Report (2) and the National Academy of Sciences’ “The Postdoctoral Experience Revisited” (3) were discussed. Topics included postdoctoral compensation, benefits, length of postdoctoral training, and career trajectories, among others. While the findings showed some progress in recent years, much more is needed. Terry Cathopoulis, Ph.D., BPC Fundraising Committee Co-Chair and one of Penn’s poster presenters, said of his experience, “’Postdocs and postdoctoral office administrators alike were genuinely interested in adopting [Penn BPC’s] vendor show fund-raising model. It was rewarding to be able to share this to the benefit of other postdoctoral bodies and contribute to a greater sense of inter-institutional community. I’m already receiving emails from people I met at the poster session that are looking to enact vendor show on their own campuses.” Adam Walker, Ph.D., BPC Co-Chair, described the NPA meeting was “an invigorating experience – in complete contrast to the sometimes stressful environment of a scientific conference, the NPA meeting presented opportunities to swap ideas openly, discuss and brainstorm ways to improve the postdoc experience.” He added that he would recommend this meeting to “postdocs who appreciate that the postdoctoral experience is more than just about working in the lab, and who are seeking additional ways to extend their professional training.” Penn’s attendees agreed that the workshops devoted to advancing individual professional skill sets were also useful. Following the NPA meeting, the BPC representatives plan on using the knowledge gained to instigate new programs at Penn in conjunction with the Biomedical Postdoctoral Program office. These include further investigating ways to advocate for improved postdoc conditions, formulating a directed mentoring program, and other career development training opportunities. The NPA meeting is held each spring; next year’s will be in Michigan. Registration will open in early 2016 at http://www.nationalpostdoc.org/meetings-and-events-4/annual-meeting. If you are interested in representing Penn at future NPA Meetings, please contact the Biomedical Postdoctoral Council (BPC). 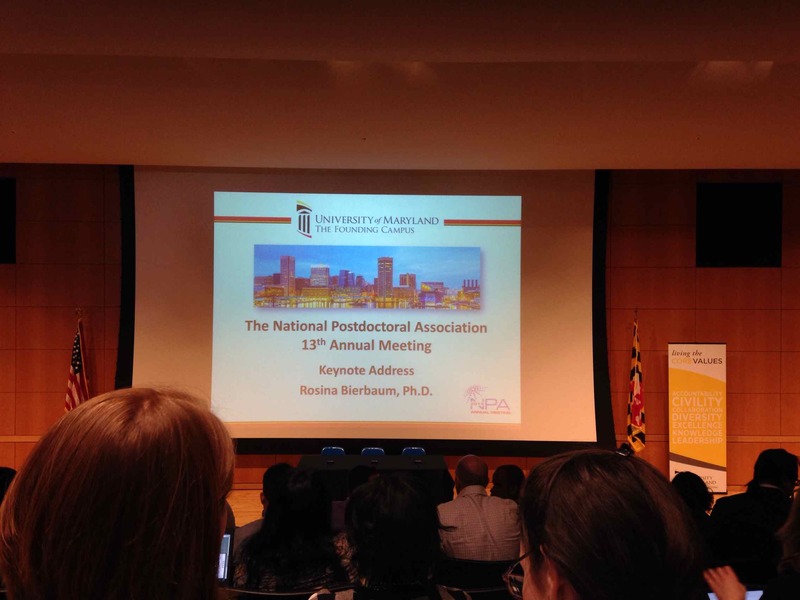 In addition, as the University of Pennsylvania is a sustaining member of the NPA, BPP-represented postdocs are eligible for free NPA affiliate membership. Members gain access to numerous career development resources and can help shape future policy development. Affiliate membership is available at http://www.nationalpostdoc.org/membership-6/member-categories/affiliate-member. 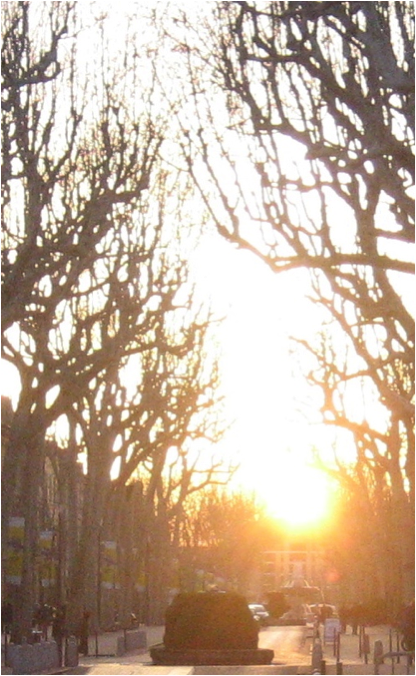 On March 2, 2013, I arrived in the sunny south of France with my life whittled down to two suitcases and feeling full of hope. Eight months earlier, I had accepted a postdoctoral position to join a lab in France. Friends and family were excited about the location. For me, the position was an opportunity to be more competitive in the academic job market with research related to a neurodegenerative disease using a mammalian animal model… which just so happened to be in France. My goal was to have my own lab some day and I knew what I needed to put on my curriculum vitae to get it – publications in top journals. I also arrived with confidence. When I graduated, my fellow labmates told me that they would be lost in lab without me because I managed the lab, made the orders, and trained all the newbies. I felt hopeful, focused, and confident. Several months later, I would feel despondent. My downward spiral happened gradually. The people in my lab* were cordial. I was invited to join everyone for lunch and the occasional social outings. But everyone at work spoke French. During my interview, my boss assured me that I would not need French for work because everyone in lab speaks English since it’s the international language of science. He meant everyone would speak English with me. Besides lunch and coffee breaks, most seminars, departmental meetings, and even some parts of my group’s** meetings were held in French and the technicians spoke limited English. At first, I embraced the challenge. I reasoned that I needed to absorb French anyway to adapt to my new resident country and to make friends. I was adamant to not become the stereotypical American, who expected everyone to speak English. I poured myself into the free French lessons through my funding agency and immersed myself by listening and watching only French programs even at home. After 3 months of this, I lost myself. Listening to other people’s conversations during lunch and coffee breaks without a chance to reciprocate and take part became cruel. I stopped going to work gatherings. I thought, “Why should I go if I I’m not going to be actively involved?” My position in France was an extreme change. I was a significant part of my previous lab and felt like a ghost in my current one. I developed the habit of crying nightly but dismissed my feelings as homesickness. I tried to regain my confidence by engrossing myself into the one thing I loved – science. I took advantage of not being able to sleep by getting to work by 6 am. I developed two successful protocols and generated data ahead of schedule. When my boss saw my progress, he told me my work had the potential for a Nature publication! I continued to cry at night and sleep very little but the prospect of a Nature paper made it ok…for another month. After a month of generating another data set for the possible Nature paper, the analysis showed that the experiment didn’t work. I unraveled. I handed in my resignation and instead of accepting it my boss gave me a week off. When I returned, he convinced me to stay for the sake of my career, which would advance with the high-impact publication. I stayed for another 8 months. Despite making a few friends, going out, and taking yoga, during this time I not only continued to cry at night but also developed a paralysis about going to work. There were days that I would be dressed, ready for work and couldn’t walk out the door. This experience depleted my confidence. I took pride in my work but found myself unable to even make the little effort to go. In May 2014, I decided to make a pit stop at my old lab during a visit to the U.S. to finalize data for my second first-author publication in person. The halls to my lab had changed but just walking back reminded me of a time I loved going to work. I felt a bounce in my step. I also saw three friends during my visit. The friends whom I stayed with prepared tacos and a special breakfast just for my visit and we played board games. Another friend and I watched Frozen, ate pizza, and played video games. The time reminded me of happiness. When I returned to my friend’s place that night, I emailed my resignation letter and didn’t waiver when my boss reminded me of the Nature paper when I returned to France and spoke to him face-to-face. At the end of May, I returned to the U.S. with the same two suitcases but with new insights included. I had discovered what I truly needed, and to my surprise it wasn’t career advancement by way of Nature. I honestly thought that my work achievements got me out the door in the morning and that the people (my labmates and mentor) were just the cherry on top. I ignored my emotions for months for the sake of my ambitions and didn’t credit the true aspects of my life that gave me a sense of fulfillment, like tacos, board games, and movies with friends. Lastly, my experience taught me the simple human desire to belong. After my experience, I realized that it’s not enough to be tolerant but inclusive as well. It’s a nice gesture to invite someone along for lunch, but it’s a more rewarding experience for everyone if they’re included in the discussions. The silver lining of such extreme situations is that they shake you to the core, and at the end you’re grasping what it is that you really hold dear. Overall, the NIH has received straightforward bipartisan support; in particular, the doubling of the NIH budget from FY98-03 led to a rapid growth in university based research. Unfortunately, since 2003, inflation has been slowly eating away at the doubling effort (Figure 1). There seems little hope for recovery other than the brief restoration in 2009 by the American Recovery and Reinvestment Act (ARRA). Making matters worse, Congress now has an abysmal record of moving policy through as bipartisan fighting dominates the Hill. Currently, support directed to the NIH is a mere 0.79% of federal discretionary spending. The bulk of this funding goes directly to extramural research, providing salaries for over 300,000 scientists across 2500 universities. As the majority of biomedical researchers rely on government funding, it behooves these unique constituents to rally for sustainable support from Congress. Along with other scientists across the country who are becoming more politically involved, the Penn Science Policy Group arranged for a Congressional Visit Day (CVD) in which a small group of post doctoral researchers and graduate students visited Capitol Hill on March 18th to remind the House and Senate that scientific research is a cornerstone to the US economy and to alert them to the impact of the erosion on young researchers. 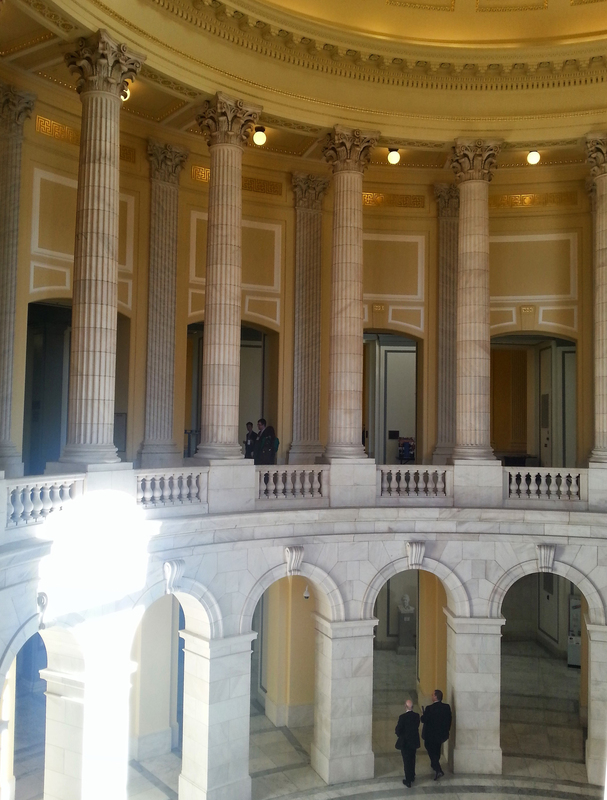 Visiting Congress to further science policy. Image Credit: BPC. 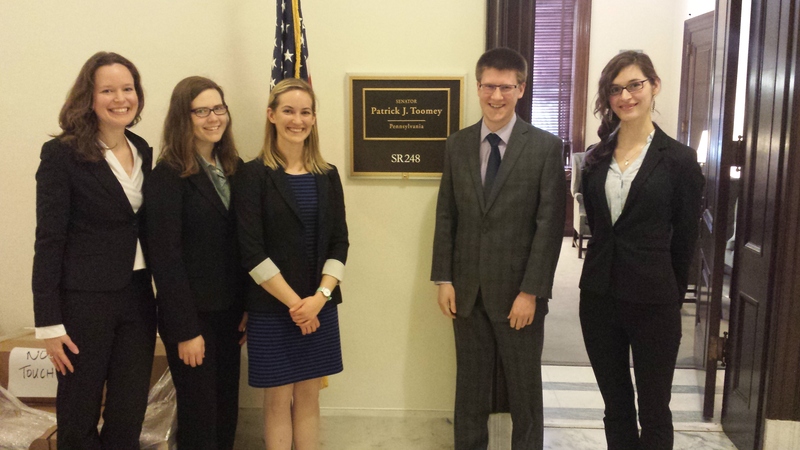 Led by post-docs Shaun O’Brien and Caleph Wilson, the group partnered with the National Science Policy Group (NSPG), a coalition of young scientists across the nation, to make over 60 visits to Congressional staff. NSPG leaders from other parts of the country, Alison Leaf (UCSF) and Sam Brinton (Third Way, Wash. DC), arranged for a productive experience in which newcomers to the Hill trained for their meetings. The Science Coalition (TSC) provided advice on how to effectively communicate with politicians: keep the message clear and simple, provide them with evidence of how science positively impacts society and the economy, and tell personal stories of how budget-cuts are affecting your research. TSC pointed out the undeniable fact that face to face meetings with Congress are the most effective way to communicate our needs as scientists. With the announcement of President Obama’s FY16 budget request in February, the House and Senate are in the midst of the appropriations season, so it was no better time to remind them of just how important the funding mechanism is. Representatives from the Penn Science Policy Group meet with lawmakers. Image Credit: BPC Staff. Meeting with the offices of Pennsylvania senators Pat Toomey and Bob Casey, and representatives Glenn Thompson and Chaka Fattah were key goals, but the meetings were extended to reach out to the states where the young scientists were born and raised – everywhere from Delaware to California. 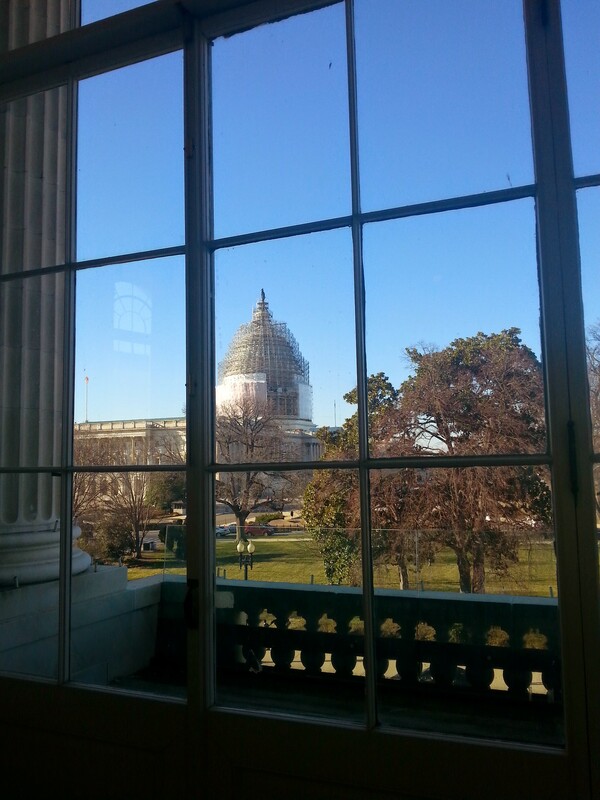 Each meeting was fifteen to twenty minutes of rapid discussion of the importance of federally funded basic research. At the end of the day, bipartisan support for the NIH was found to exist at the government’s core, but the hotly debated topic of how to fund the system has stalled its growth. We mentioned the “Dear Colleague” letter by Sen. Bob Casey (D-PA) and Sen. Richard Burr (R-NC) that is asking budget appropriators to “give strong financial support for the NIH in the FY2016 budget”. Sen. Toomey didn’t sign onto it last year, especially as that letter asked for an increase in NIH funding to $31-32 billion and would have violated the sequester caps-which Sen. Toomey paints as a necessary evil to keep Washington spending in check. I asked the staffer for his thoughts on this year’s letter, especially as it has no specific dollar figure and Sen. Toomey has stated his support for basic science research. The staffer said he would pass it along to Sen. Toomey and let him know about this letter.Unfortunately, three weeks later, Sen. Toomey missed an opportunity to show his “newfound” support for science research as he declined to sign a letter that essentially supports the mission of the NIH. I plan to call his office and see if I can get an explanation for why he failed to support this letter, especially as I thought it wouldn’t have any political liability for him to sign. Working with Congressman Chaka Fattah balanced the disappointment from Toomey with a spark of optimism. Rep. Fattah, a strong science supporter and member of the House Appropriations Committee, encourages scientists to implement twitter (tweet @chakafattah) to keep him posted on recent success stories and breakthroughs; these bits of information are useful tools in arguing the importance of basic research to other politicians. Keeping those lines of communication strong is the most valuable role that we can play away from the lab. Walking through the Russell Senate Office building, a glimpse of John McCain waiting for the elevator made the day surreal, removed from the normalcy of another day at the bench. The reality though is that our future as productive scientists is gravely dependent upon public opinion and in turn, government support. The simple act of outreach to the public and politicians is a common duty for all scientists alike whether it be through trips to the Hill or simple dinner conversations with our non-scientist friends. 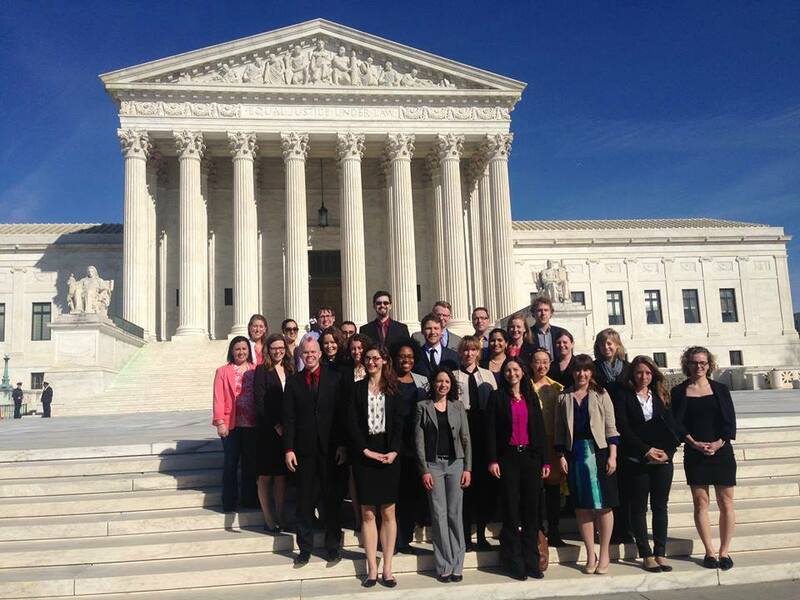 Participants represented either their professional society and/or the National Science Policy Group, independent from their university affiliations. Support for the training and experience was provided by both the American Academy of Arts & Sciences (Cambridge, MA) and the American Association for the Advancement of Science (AAAS of Washington, DC). 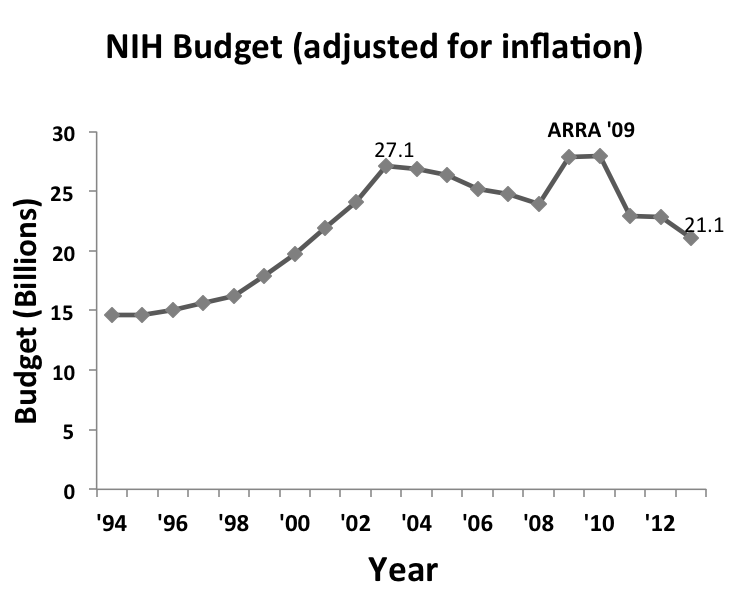 In the early 1990s, the NIH budget increased dramatically. However, over the last 10 years the NIH budget has flatlined and even decreased at times. Unfortunately, the budget has not kept pace with inflation and rising costs of executing experiments. With changes in the economy and the sweeping budget cuts that came in with sequestration, government agencies, institutions and investigators can better plan with predictable budget appropriations that keep pace with scientific opportunity. Increased trainee base pay that encourages doctorate level scientists to remain in the research enterprise. The National Academy of Sciences (NAS) recently published a review of postdoctoral training and put forward recommendations to improve the trainee experience. 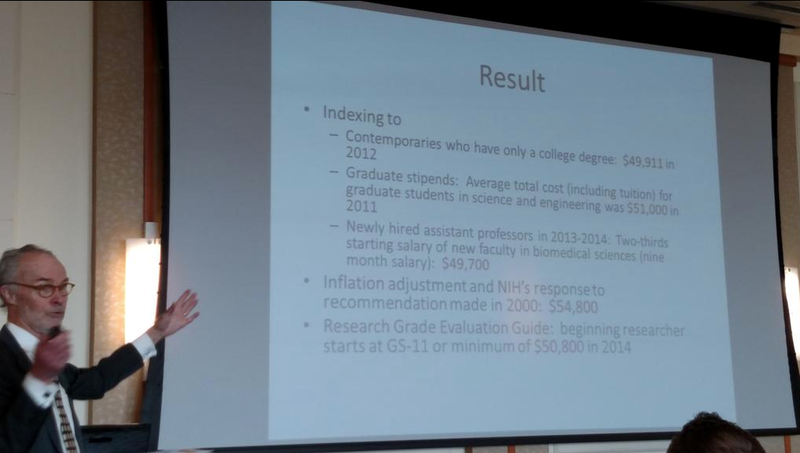 Major among the recommendations was to increase the National Research Service Award (NRSA) base pay for postdocs with one year or less of experience to $50,000 (current base pay is $42,000). Increased pay scales would likely have the added impact of making highly sought postdoctoral openings even more competitive. Strongly encourage individual development plans to be widely instituted at the undergrad and graduate student educational levels. Career planning is critical to smoothly transitioning into and out of the trainee period. 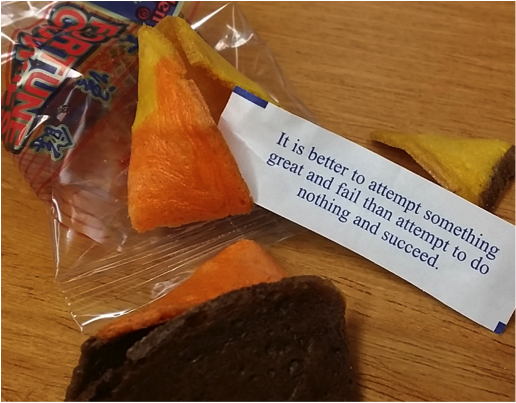 The earlier career preparation begins, the clearer the path that trainees have to navigate. This is especially important now that funders like the NIH are looking to diversify trainee career paths. An Individual Development Plan (IDP) that trainees, mentors and programs can use as a communication and expectation guide will ensure that the taxpayer investment in education and training results in rapid employment after the training period. Incentivize graduate programs admissions and faculty search committees to hire under-represented minority candidates in order to keep early-career scientists in the STEM pipeline. Federal research agencies have made a significant investment in diversifying the research pipeline, and there have been improvements at the trainee level. However, the numbers are not reflective of the population demographics. In order to get the most of the taxpayer investment, policymakers should find ways to incentivize graduate programs and faculty hiring committee efforts to diversify. A recent large scale study of new doctoral graduates shows that increases in diversity of the STEM pipeline have not been mirrored in tenure track faculty hires. Further, under-represented minority candidates are opting to leave the scientific bench. Funders should work with institutions to ensure that effective “junction points” are added to the STEM pipeline to ensure that highly qualified scientists remain interested in academic research. Include more opportunities for graduate students, postdoctoral fellows and assistant professors to take part in science policy formulation. The last few years have seen the rapid growth of science society-run policy fellowships, trainee-led science policy groups and regular visits to state and federal governments by scientists. These activities have resulted in more scientists openly and consistently communicating about science policy. The next phase should include increased opportunities for trainees and new professors to be at the table when science policy decisions are made. I encourage citizens, undergraduates, graduate students and faculty to continue their conversations. 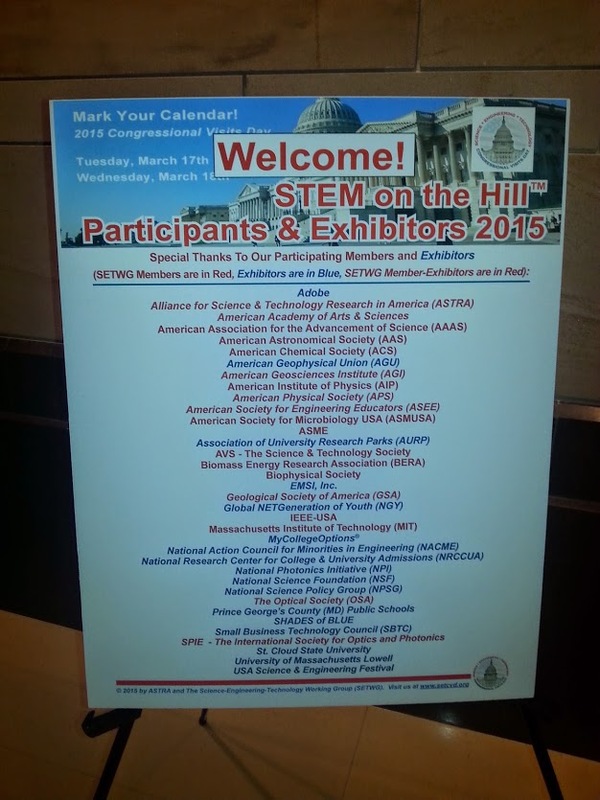 More importantly, reach out to their respective congressional delegations to share their positions on science issues. The above wish list can serve as a conversation guide for trainees, scientists and policymakers. Through consistent engagement and relationship building, all stake holders can effectively work together to ensure that the U.S. scientific enterprise maintains its place as the leader in STEM research and development. Many of us know someone suffering from a debilitating brain disease, such as amyotropic lateral sclerosis (ALS), Alzheimer’s disease (AD) or Parkinson’s disease (PD), which mainly affect the older population. It is estimated that people aged 60 and above will number nearly 2 billion by 2050 (http://www.un.org), thereby increasing potential sufferers of these diseases and resulting in a grim future for the elderly population. In the U.S. alone, the number of AD patients aged 65 years and above may triple (to 13.8 million) by 2050 . 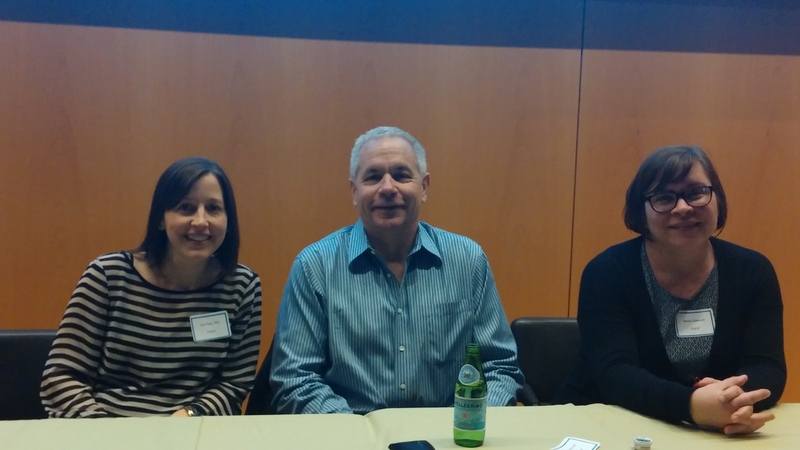 To create awareness for what lies in the future for patients and families, the students of the neuroscience graduate group (NGG) at the University of Pennsylvania (UPenn) hosted a public seminar/forum called “Degeneration in the Aging Brain” at the Smilow Center for Translational Research on the evening of March 12th 2015. Three neuroscientists from UPenn and Children’s Hospital of Philadelphia (CHOP) presented TED-style talks on AD and PD in a fully packed auditorium. Prior to the talks, short activities/demonstrations to test memory and learn more about the brain were shared with participants. Renowned neuroscientist and UPenn Professor Virginia M.Y. Lee talked about how misfolded proteins in AD and PD, tau and alpha synuclein respectively, can corrupt healthy neighboring cells of the brain. In her groundbreaking research she showed that when synthetic alpha synuclein preformed fibrils (pff) were injected in the dorsal striatum (the area of the brain affected in PD) of normal wild type mice, PD pathology in the form of phosphorylated alpha synuclein positive Lewy body (LB) like accumulation, was observed at the injection site within 30 days. The pathology later spread to interconnected parts of the striatum – cortex and olfactory bulb, recapitulating the disease progression observed in humans. By six months post-injection the mice developed severely impaired balance and motor control, thus indicating that pathology develops first followed by dopaminergic cell death . According to Prof. Lee, this is a better model than the transgenic and neurotoxin-based animal models of PD, as these do not completely recapitulate the neurodegenerative cascade observed in humans. Similar observations were made in rat and monkey independently by her two collaborators. Furthermore, her work gives hope for a possible treatment for PD when she shared that alpha synuclein monoclonal antibodies can block the entry of alpha synuclein PFFs and cell-to-cell transfer of the pathologic aggregates . She has also taken a similar approach in her AD research where unilateral injection of tau PFF in the hippocampus of transgenic mice led to the formation of neurofibrillary tangles (NFT) in one month on both the sides. By six months the NFTs on the ipsilateral side propagated to diverse areas of the brain that were anatomically connected to the injection site confirming that the pffs act as seeds and convert normal tau into aggregates . Prof. Lee stressed to students and researchers that cell death should not be measured as a marker for neurodegenerative diseases like AD and PD because cells live for a long time with these toxic accumulations. It takes years for neurons to die when symptoms start to appear. Another speaker, Prof. Harry Ischiropoulos from CHOP, described why he thinks antioxidants might have therapeutic role in neurodegenerative diseases. Out of the current 347 open active clinical trials in this area, only 21 aimed to slow or prevent the disease progression, 4 of which use antioxidants. The final talk was delivered by the young and promising clinician-scientist Dr. Alice Chen-Plotkin from Perelman School of Medicine at UPenn. She shared her success in identifying ApoA1 as a new biomarker for PD . Her group screened 96 plasma proteins by multiplex immunoassay in a discovery cohort of 152 patients. Out of the 11 proteins that showed nominal correlation with PD age at onset, she pursued one with the second most hit, ApoA1 (p=0.001) because of its biological relevance – being the main component of “good” or high density lipoprotein (HDL), and its important role in reverse cholesterol transport. Lower plasma levels of ApoA1 correlated with earlier PD onset. This association was also replicated in an independent cohort of 187 PD patients (p<0.001). When analyzed in a cohort of 134 high-risk, asymptomatic subjects, lower plasma ApoA1 levels associated with greater dopamine transporter deficit (p=0.037) in the putamen (area affected in PD). Lower plasma ApoA1 also correlated with the severity of PD in both the discovery and replication cohorts . ApoA1 level is known to be elevated by statins and the lipophilic form can cross the blood-brain barrier. However, since only a very few patients recruited in the discovery cohort were taking a statin, its role in lowering the risk of PD is to be determined in future studies. The lectures were followed by a reception including refreshments and drinks, where people had the opportunity to talk to the scientists. The research on neurodegenerative diseases in CHOP and UPenn shows great promise especially with respect to PD. Future studies will hopefully reveal the efficacy of antioxidants, statins or monoclonal antibodies as potential therapy for various neurodegenerative diseases. Hebert LE, Weuve J, Scherr PA, Evans DA (2013) Alzheimer disease in the United States (2010-2050) estimated using the 2010 census. Neurology 80: 1778-1783. Luk KC, Kehm V, Carroll J, Zhang B, O’Brien P, et al. (2012) Pathological alpha-synuclein transmission initiates Parkinson-like neurodegeneration in nontransgenic mice. Science 338: 949-953. Tran HT, Chung CH, Iba M, Zhang B, Trojanowski JQ, et al. (2014) Alpha-synuclein immunotherapy blocks uptake and templated propagation of misfolded alpha-synuclein and neurodegeneration. Cell Rep 7: 2054-2065. Iba M, Guo JL, McBride JD, Zhang B, Trojanowski JQ, et al. (2013) Synthetic tau fibrils mediate transmission of neurofibrillary tangles in a transgenic mouse model of Alzheimer’s-like tauopathy. J Neurosci 33: 1024-1037. Qiang JK, Wong YC, Siderowf A, Hurtig HI, Xie SX, et al. (2013) Plasma apolipoprotein A1 as a biomarker for Parkinson disease. Ann Neurol 74: 119-127. The Junior Investigator’s Symposium, held at the Smilow Center for Translational Research, organized by Dr. Dennis Durban and Dr. Emma Meagher, began with a warm welcome speech by Dr. J. Larry Jameson, M.D., Ph.D., Dean of the Perelman School of Medicine, who talked about the unique advantages and culture of success being fostered at Penn; Penn being the only research institute with world-class schools for Veterinary, Business, Medical, Nursing, Engineering, and the fields of Arts and Sciences in close proximity to each other, thus providing fertile ground for collaboration and promoting individual success. A line that particularly resonated with the audience, funding for research always being a critical issue, was Dr. Jameson’s assurance that, in his 40 plus year career in medicine and research, funding for biomedical research, with its ebbs and flows, has never not been an issue. He assured the audience that correct planning, seeking constructive criticism, and diversifying one’s scientific focus will enable a researcher to continue to both reinvent themselves and their bailiwick, thus allowing a long and fruitful career in biomedical research, regardless of a capricious funding climate. Dr. Jameson delivers the keynote address. Image Credit: Kriti Gaur. The Dean’s address was followed by a lecture on Optimizing Successful Outcomes for Clinical and Translational Scientists, delivered by the impeccably multi-tasking Dr. Emma Meagher, M.D., who fulfills roles including Associate Professor of Medicine at HUP, and Executive Chair of the Institutional Review Board at the School of Medicine, among others. She cited presenting one’s research, successful fellowship completion, budget making, leadership skills, and conflict management as the five critical areas a scientist must gain proficiency in to be successful. Among the conference organizers, Dr. Meagher and Durban. Image Credit: Kriti Gaur. This was followed by a presentation on Taking Ownership of Your Career, that was split into a) Being an effective mentee and b) Integrating goals for work/family life and developing an individual career development plan. On the topic of fostering a healthy mentoring relationship for junior investigators, panelists Tiffani Johnson, M.D., Nuala Meyer, M.D., M.T.R., and Michael Grandner, Ph.D., M.T.R., advised researchers to follow the 5 principles of being proactive, respectful, responsive, organized and appreciative of their mentors. The panelists suggested that by having a detailed list of one’s goals, expectations, and needs, and effectively communicating those needs to mentors during individually scheduled meetings, one could hope to have a satisfactory relationship with one’s mentor. In such a relationship, one’s individual roles, as well as questions of authorship and ownership have been clearly discussed, and the transition to becoming an independent investigator is the overarching goal. Lastly, the panelists stated that a successful symbiotic mentor-mentee relationship includes frequently reflecting on the relationship and acquiring skills, experience, or knowledge in the areas of 1) Scientific thought process/methods 2) Grant and manuscript writing, and 3) Professional development. Having an honest evaluation of one’s values and objectives, discussing them with one’s mentor, and revisiting these points occasionally can help junior investigators not only get the most out of their mentorships with senior scientists but also end bad or unfruitful professional relationships. On achieving work-life balance, panelists Kate David, M.D., M.T.R., Jeffrey Gerber, M.D., Ph.D. And Andrea Kelly, M.D., M.S.C.E. Shared powerful personal stories of their struggles with achieving this balance, including having spouses with an academic career of their own, having and raising children, and dealing with family illnesses. The panelists advised the audience that work-life balance is an amalgam of negotiating and taking on evolving roles as one’s children get older or family roles shift. They reiterated the wisdom of turning off one’s cell phone to be fully present at home, as well as accepting that at certain times in one’s career or life different things like grant submissions, conferences, pregnancy or tending to a sick family member may take priority. The panelists also suggested taking advantage of the University’s family friendly policies, such as “stop the clock” for new parents on the tenure track. From this point on, the symposium was split into basic science and clinical/translational science researchers, and further with their affiliation with either CHOP or Penn. There were four more sessions titled Funding Your Research Part I-How research is paid for and developing a budget, How to Navigate Research Resources, Building a Team & Hiring and Managing, and Funding Your Research Part II– Writing a Career Development/K award. Panelists Michael Johnston, Brenda Ryn, and Marianne Achenbach along with moderator Susan R Wahl, Interim Director of Research Administration, Department of Medicine, geared Funding Your Research Part I at conducting clinical studies at Penn, where the key points were estimating study startup costs, and facilities and administrative (F&A) rates, (Additional information about F & A costs can be found at the following websites: http://www.finance.upenn.edu/vpfinance/fpm/2100/2100_pdf/2116.pdf and http://www.med.upenn.edu/orss/docs/Updated_PSOM_FA_Guidance_ 8-20-13.pdf.) 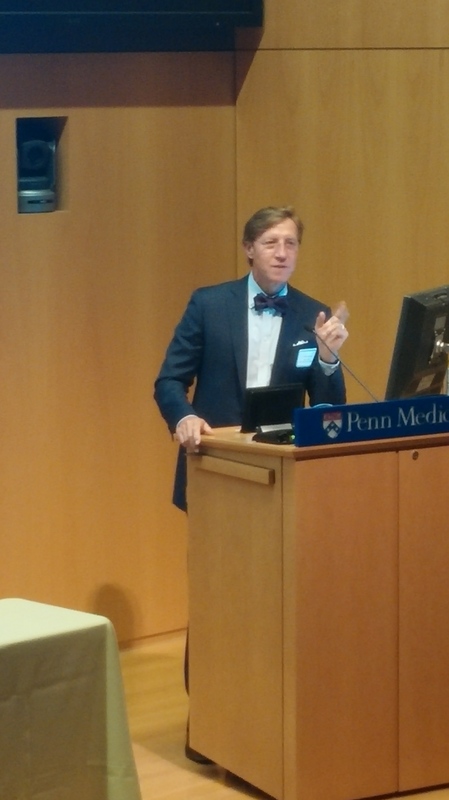 During the How to Navigate Research Resources session for Penn labs, Dr. Glen Gaulton, Ph.D., Executive Vice Dean and Chief Scientific Officer, provided a glimpse into 23+ Biomedical Research Core facilities. These cores have state-of-the-art equipment and technical expertise, and provide individual hands-on training, support and consultations for faculty and trainees. The multitude of core facilities can be accessed at the following website: www.med.upenn.edu/cores/. Troy Hallan, M.S., V.M.D., DACLAM, Director of Animal Welfare at the University of Pennsylvania, focused on navigating animal resources, including the cooperation between the Institutional Animal care and Use Committee (IACUC), and the Office of Animal Welfare (OAW), and effectively utilizing ARIES, Animal Research Information and Electronic Submissions website, https://aries.apps.upenn.edu/laProtocol/jsp /fast2.do to prevent delays in animal protocol approvals for research use. 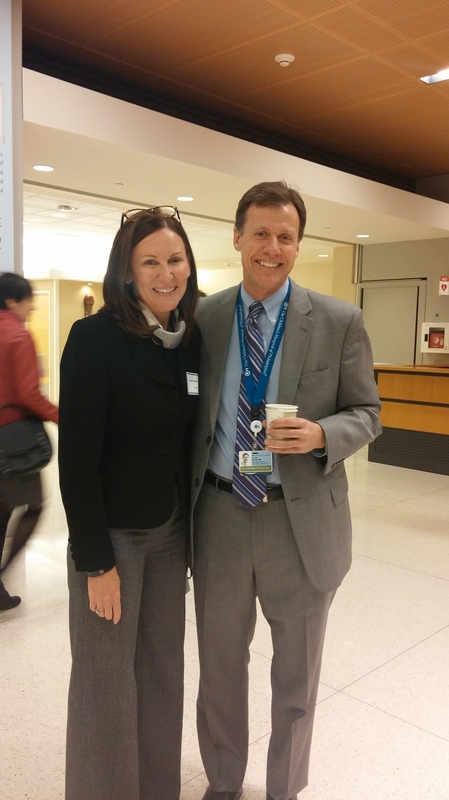 On the topic of Building a Team & Hiring and Managing for Penn labs, Panelists John Maris, M.D. and his lab members, Lori Hart, Ph.D., and Maura Diamond, research assistant, discussed the importance of finding passionate, driven students/researchers (using referrals etc.,) and managing them. They discussed pros and cons of hiring a lab technician versus a postdoctoral researcher versus a graduate student as a junior or early career investigator with limited start-up funds. For investigators interested in Clinical/Translational Research at Penn, information on Research Staff Selection, Research Process Training, Research Protocols in Action can be accessed at http://www.med.upenn.edu/scrcm/ and http://www.upenn.edu/IRB/ and https://somapps.med.upenn.edu/pennmanual/secure/. In the final Funding Your Research Part II– Writing a Career Development/K award session, panelists Johnathan Katz, M.D., Michelle Denburg, M.D., M.S.C.E., David Irwin, M.D., and Kate O’ Neill, M.D. Emphasized the importance of understanding one’s eligibility for an NIH K award, applying for the right one (e.g. K01, K08, or a K99/R00), and resubmission or renewal. They also emphasized getting to know one’s Program Officer, who can provide valuable insight on applicant suitability for a particular K award and steps to take for a successful funding. Dr. Katz also covered the parts of a K award application, including criteria used to review and score an award application. Finally, prospective K award applicants should be mindful to write their research plan for an experienced scientist but not necessarily an expert in your field, to not be overly ambitious, and to stay focused throughout the application. The training and research plan should fit together like a hand in a glove; http://grants.nih.gov/grants/peer/critiques/k.htm. I found the Junior Investigator’s Symposium to be extremely informative in navigating the minutiae of biomedical research and the numerous aspects and multiple responsibilities one must assume on the road to becoming a successful independent scientist in the Penn community.